I don’t know how many double bass concertos there are from the classical era, but these are the first I’ve heard, which makes them especially interesting. 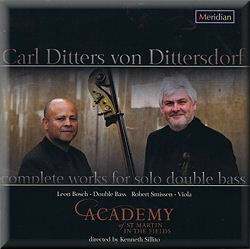 The bass actually makes a good solo instrument when its full range is exploited, and Carl Ditters von Dittersdorf - possessor of one of the most amusing names of any composer - does interesting things with it, mostly. There are a few passages where the soloist piles on notes to show off virtuosity, and these aren’t especially interesting, but, for instance, the second concerto’s adagio is six minutes of truly wonderful music with an excellent, sensitively scored solo part. Broadly speaking, it’s impressive that Dittersdorf can keep the double bass afloat above the rest of the orchestra, and that the composer uses the instrument’s range to best effect. Soloist Leon Bosch, who’s done several excellent solo albums on this label before and who according to the booklet can be heard on Madonna and Michael Jackson albums, articulates the melodies and virtuosic business very clearly, from harmonics to the lowest rumbles. Those of you who don’t love the double bass won’t find this music irritating at all. Those of you who love neither the double bass nor 18th century music are reading the wrong review anyway. There are also two works pairing bass and viola, sort of an all-star team of underappreciated solo instruments. I have a soft spot for viola myself, and so did Dittersdorf, as he sometimes set the violin down to play it. The Sinfonia Concertante introduces the soloists almost immediately, collaborating on the exposition of main themes, and they mostly enter dialogue with each other, including a quality double cadenza. Indeed, in the slow movement a reduced orchestra more or less doubles the viola part. There’s a fantastic minuet and a finale where the orchestra finally gets something to do. The duet for viola and bass is, at 20 minutes, the longest piece on the album — and my favorite. Its give-and-take, its serenade-like lyricism, and easygoing virtuosity are a winning combination. Bosch and violist Robert Smissen are impeccable here, their playing a full refutation of the idea that these are second-rate solo instruments. The sound is very good: somewhat reverberant, like sitting in the middle of the concert hall, except that Bosch’s solos are never lost inthe texture. In fact, his instrument is presented very well. For the duet, things get much more intimate: it’s more like sitting onstage. A friendly note to Meridian, though: don’t darken the text on a black cover, as it becomes rather hard to read. To readers, yes, that’s Leon Bosch on the left and Robert Smissen on the right. Probably not essential, but certainly should appeal to curious listeners to the classical era or double-bass enthusiasts.